I am using a tube from Moshilove in this tutorial. Using this art or any art from AIL requires you to have a license and display it within your creation. 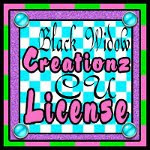 You can get the art and the license from Artistically Inclined Licensing. 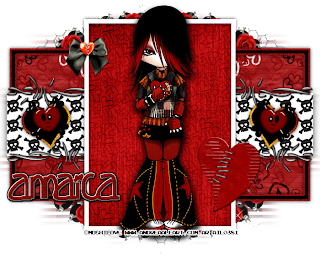 I am using my very own scrapkit called Vicious Valentine and you can get it at Twilight Scraps or Heartbeatz Creations or AIL. 1. Open template, delete top layer of copyrights. 2. Open tube of choice. Scale to the right size to fit if need be. 10- move to bottom of layers box, will be used later. 11- scale to 488 x 488 place above Raster 3 layer in template. Right click on Raster 3, ALPHA TO SELECTION. Click on paper 11 layer to activate then go to LAYER>CROP TO SELECTION. Delete original template layer. 1- scale to 690 x 690 then right click on Raster 2 layer of template, ALPHA TO SELECTION, click on paper 1 layer in layers box to activate then go to LAYER>CROP TO SELECTION. Delete original template layer. Add drop shadow go to FILTERS>LIGHT AND SHADOW and add a drop shadow with settings at 0/0/25. 6- scale to 538 x 538, duplicate, flip, place to left of other paper, so they're touching... merge the two together. place above the black rectangle in template- Raster 1 layer. Right click on the template layer in layers box, scale layer to 800 x 400 then right click again, ALPHA TO SELECTION and then left click once on the merged paper layer to make it the activated layer. Go to LAYER>CROP TO SELECTION. The paper is now that layer, so you may delete the template layer. 5. Right click on Raster 4 of template in layers box ALPHA TO SELECTION, add new layer, fill with white. Delete original template layer. Add drop shadow with same settings as used in step 4. 6. Ok, now use the color picker tool to get a gold hue from the tube layer, switch to background layer and use color picker to get a red hue from tube. Right click on copy of Raster 5 (right heart in template) ALPHA TO SELECTION, add new layer. Use gradient tool, linear shape, no repeat and drag from right top to left bottom edges of heart. This may take a couple times to get right, you can do it tho. Repeat on the left heart, going from left top to right bottom. Now make sure the Raster 5 and copy of raster 5 layers and above/below each other in layers box and merge the top down so the hearts are now one layer. Do the same with the gold/red hearts we just filled in. So there should be 2 layers- one of the colored hearts and the other would be the grey hearts. Right click on the colored hearts, ALPHA TO SELECTION, SELECT>SHRINK by 4 and hit delete on keyboard. Add noise to this with same settings as used earlier. Activate the grey hearts layer now and go up to COLORS>BRIGHTNESS/CONTRAST. slide brightness all the way down and contrast all the way up and hit ok. The hearts are now black. 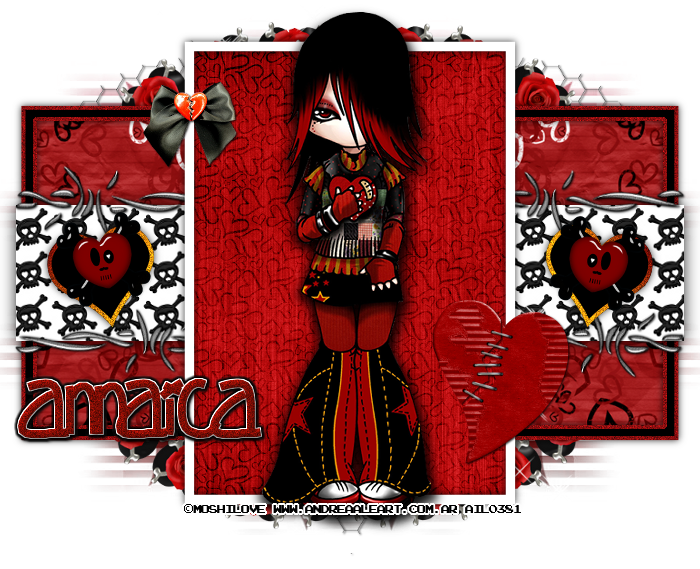 Merge the colored and black hearts together, add drop shadow with same settings as before. 7. Delete Raster 7 and then drag and drop the mask into the canvas. Scale to 700 x 700 and place on left side of the canvas just so the edges are sticking out beyond the template layers on the left... Now go up to COLORS>INVERT and LAYER>TRANSPARENCY>COLOR TO ALPHA to make the mask transparent. Duplicate and flip then place the duplicate on the right side of tag just as you did with it on the left. Merge the two together. Ok, now drag the paper 10 layer up a little so the bottom of it is equal with the bottom of the mask layer. Right click on the mask layer, ALPHA TO SELECTION then click on paper 10 layer to activate it go up to SELECT>INVERT and EDIT>CLEAR. The paper 10 layer is now the mask layer so you can delete original mask. 39- scale to 508 x 515 (place slightly off center to left. Duplicate and place copy slight to right side. 9. Add drop shadows to anything else you'd like, the tube, etc. Make sure at this time you also place the correct copyright info- copyright symbol, artist's name, website and your license number if applicable. Save as .xcf so you can come back and make changes if you need to. 10. Add a name by using the text tool, type in a name with a font you like. I am using the font called gamesGetchuNoWhere. Right click, ALPHA TO SELECTION in layers box and SELECT>GROW by 1 fill a new layer with white, SELECT>GROW by 2, fill with black. Merge the red and white layers together, go to FILTERS>DECOR>ADD BEVEL at 5. Make black layer activated, go to FILTERS>BLUR. Then add a drop shadow with settings as before. If you have a white background layer, delete it now then save your finished tag as .png so the background will stay transparent.